It is very cold because a storm is raging in the mountains of China. A snow leopard has just been born. He is meowing and trying to snuggle with his momma, but she is not responding. Right before this little snow leopard was born, his momma was pushed off the mountain by an avalanche. She managed to climb out of the snow and back to the group of snow leopards that were trying to cross the mountains. Then he was born. Two of the other females had cubs of their own, but they knew one of them needed to take care of this little one. Tai, pronounced Ty, which means big has one cub. He's a boy named Fu, pronounced Foo, meaning wealthy and fortunate. The other female is An, pronounced Ahn, meaning Peace. She has two cubs. Her son is named Piao, pronounced Pee-ow, meaning handsome. Her daughter is named Ya, pronounced Yah, meaning graceful. They both wanted the new cub, but it was decided by all present that Tai would take him because she had only one cub. An was very sad and had a bad feeling about the decision. Tai took the new cub into her mouth and carried him to her den. She named him Boajia, pronounced Bow-jee-ah, which means protects the family. Tai wanted Boajia not as her cub but as a servant. She trained him from that first day that he was not as important as Fu. Boajia had to sleep just outside the den. Tai and Fu cuddled together for warmth, but Boajia was alone in the elements. His fur was warm, but it would have been nicer to have the comfort of the others. He was not given as much food as Fu received. Tai hunted and brought back the prey for consumption and only let Boajia have a small portion. He was not growing as fast as he should. He was a skinny snow leopard whereas Fu was fat. Fu was fat because he got more food, and he didn’t have to work. Boajia had to clean up the den and tote the bones away from where they ate. Tai treated Boajia roughly and soon Fu did also. She let Fu shove and sink his teeth into Boajia’s flesh. Boajia was a very unhappy Snow Leopard. He obeyed Tai and put up with Fu. He was kind to them and didn’t complain. He worked hard every day then went to sleep cold and hungry. He was also lonely. One day, An and her cubs came for a visit. An was surprised and saddened at how Tai treated Boajia. Tai would not let Boajia play with Fu, Piao, and Ya. He climbed up on a rocky area and laid down to watch them play. An watched him and felt a tang of sadness, and a love started swelling inside her for the lonely mistreated cub. That night, as they all lay down to sleep, An tried to get Tai to let Boajia sleep with them inside the den. She refused and said it was his place. An didn’t get much sleep that night, but she devised a plan. The next morning, An said she wanted to talk to Tai about something important. First, she reminded Tai about her hunting ground. Tai’s hunting ground was not as good as An’s. An didn’t have to hunt far or long for their prey. An asked Tai if she wanted to trade hunting grounds. Tai sat up straighter and asked what she wanted for it. An said she wanted Boajia. She said they would trade dens and hunting grounds but she would also get Boajia. Tai could hardly contain her excitement and jumped up and called for Fu. Together they left to their new home. An ran out and called for her cubs and Boajia. An told them what she had done. She explained to Boajia that he would be one of her cubs. She told Boajia that she was going to change his name to Bao, pronounced Bow, meaning treasure. She said Bao was her treasure and she loved him. Piao and Ya were so excited they ran at him. Bao jumped back. An said for them to take it easy because he wasn’t used to nice tackles and hugs. An told him he was going to eat and sleep with the family. She said they all did the chores around the den. He wasn’t expected to sleep outside or do all the work. Bao didn’t know what to say. Then a tear slid down his face. An carefully put her paw around him and drew him close. Months went by, and you would think Bao was a different cub. He was putting on weight and was learning to hunt. You could catch him playing with his new brother and sister. He felt loved. 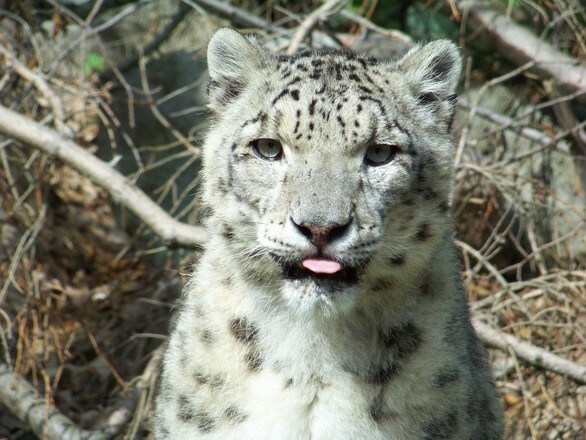 He was a happy and contented snow leopard. 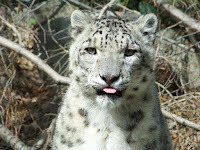 Our Snow leopard Boajia didn’t do anything to be adopted into An’s family. An loved him and wanted him as her own. He was given the rights of the other cubs. He became her cub. Boajia could have rejected that precious gift of a new loving family by running off and following Tai. An gave up her home and hunting ground just so she could love this little cub and have him in her family. Before we trust Christ as our Savior, we belong to Satan’s family. When we trust Jesus Christ as our Savior, we are brought into God's family. The Bible calls that adoption. As Christians, we are adopted into the family of God. We don’t deserve the right to be placed into God’s family. God has chosen us to be His children. God loved us so much He purchased us with Jesus' death to be brought into his family. All we need to do is accept that gift. Have you been adopted into the Lord’s family? Have you trusted Jesus as your Savior? If you want to read more about this, you can read my lesson on Salvation. I John 3:1 Behold what manner of love the Father has bestowed on us, that we should be called the children of God. Memorize: I John 3:1 Behold what manner of love the Father has bestowed on us, that we should be called the children of God. What a great post! I will be telling this story in my Sunday School class...we are adopted! Joint heirs! Thank you, Alicia! Please feel fee to use any and all of these lessons! I appreciate the feed back! Pity you couldn't give credit to the people who own the images. Most people call this 'copyright' stealing. I'm sure that's against the rules in your bible isn't it? Sorry, I can't edit my post. But I did find your lesson on 'Stealing'. Perhaps you should read it again? Ephesians 4:28a Let him who stole steal no longer.